OneKnob Wetter, Software algorithmic reverb from Waves in the Oneknob series. Adyssey Beats's review"One knob is too little for wetness"
There were no compatibility issues installing any of the other six One Knob plug-ins, One Knob Wetter being no different. The general setup of the plug-in, as with the others, is as simple as it gets. One knob sits in the middle of the display. When you raise the knob an aesthetically pleasing canary-yellow light indicates the effect's level, also displayed in a number between 0 and 10 in the lower right hand corner. Because of it's simplicity I have never felt the need to read the manual, but I can imagine as with the rest of the Waves plug-ins that it would be well-written and helpful. Running in Ableton Live 8 on my MacBook Pro with a 2.7Ghz Intel Core i7 processor and 4GBs of RAM, Waves' One Knob Wetter is as smooth as clockwork. Being a fairly light plug-in with regards to CPU usage, it is stable and reliable even in situations with many other effects and VSTs operating simultaneously. That said, I do not use the One Knob series too much. This is for the simple fact that they don't offer enough versatility. There is literally one, and only one way to affect the signal. Although easier for producers who may not want to go through the trouble of learning more complex interfaces for adding depth to their mix, is it worth the money? The product can either be purchased as a part of the Waves One Knob package deal, or with the Mercury bundle. If you are really dying the try it, get a much better deal by buy the Mercury bundle and getting the entire library of other top-of-the-line plug-ins that comes with it. Overall I wasn't totally satisfied with the One Knob series by Waves, but there were some viable pros to help balance the cons. The pros: their simplicity, stability, and superior sound quality. Adding depth with this plug-in couldn't have been easier and sounded really great on some vocal and instrumental tracks I auditioned it on. The cons: lack of versatility in expression, and limited realistic use in a professional production environment. Although there is a One Knob to solve everything, it isn't always the right plug-in to just throw in the mix and crank up, because at the end of the day you don't have the ability to tweak it exactly how you want it. 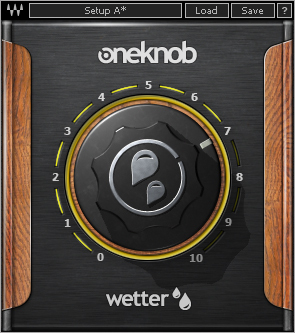 The One Knob Wetter, although expressive in its own way, lacks enough flexibility for me to really recommend it as a worthwhile product to invest it, but if you get it as a part of the Mercury bundle I would encourage you to try it out just to know how it sounds. There are certainly great situations where the exact One Knob Wetter sound is what you need. Hatsubai's review"Add that 80s shine"
Waves has recently released a new products for those who need something very simple to use. The software is part of the OneKnob series, and just as the title says, these plugins only have one single knob to control the effect. In a way, these plugins are a bit gimmicky. However, they really do work quite nicely. The plugin is very simple to use. To increase the depth of your mix, you simply add this to whatever bus you want more 3D sounding, turn the dial until you get the sound you want and leave it be. It's that simple. 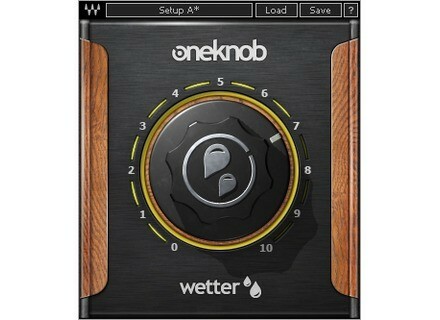 The OneKnob Wetter is included in the OneKnob package series or the Mercury bundle. Both of these will get you the product, so it's not like you're just buying a single plugin. In one way, it can be a bit of a pain as the OneKnob package alone is around $300ish. Even though it includes seven of their plugins, I find it to be a bit of a ripoff. The Mercury bundle makes it a bit easier to swallow, but that thing costs a ton anyway, so you'd better be getting every single plugin that Waves offers. Waves plugins have always been some of the most stable plugins I've experienced. They're cross platform compatible, so they'll work with both PCs and Macs. As a Mac user, that's a huge advantage for someone like me. They run in 32 bit mode, but Logic uses a wrapper-like application that runs so you don't interfere with your 64 bit interface. I've tried this on various different buses, and it seems to work on anything with ease. It even works nicely on MIDI, which I found a bit surprising. There are no performance issues at all, and that's a huge plus when working in a DAW filled with all kinds of synths and tracks running tons of plugins. These plugins came with my Mercury package, and I've had that for a few months now. I've used this plugin on some clean tones and leads for that 80s sound, but it's a somewhat limited plugin. It can work on vocals, depending on what you're doing with them, but considering I mostly play heavy metal, the plugin has limited usage in my application.